Neeraj sends this report from Nepal..
And the report of damage within Nepal is here:http://www.ekantipur.com/2011/04/04/top-story/5.7-quake-causes-minor-damages-in-baitadi/331976.html. Look at the day temperatures in the sub-continent on Monday, 4th April. A couple of 39s, and some 38s. Highest in India being at Kurnool, 39.4c. and the entire Northern region is in the 33/34 range. Kashmir and H.P. were very cold today, with the highest in Srinagar at 10c. The departure from normal map from IMD says it all ! Across the border too, the days were less hot on the 4th, with the highest in Pakistan showing 38.6c at Lasbella. A thundershower on Monday noon turned weather pleasant for the residents of Islamabad. Day was comfortable with a high of 21c and low dropping to 9c on Monday. But, A1 sprang a surprise in Muree. The hill station reieved snowfall, and according to reports, the last time it snowed in April was in 1996. Seeing days getting hotter in Sindh again, to 42/43 levels, next 3 days. Forecast for Tuesday/Wednesday/Thursday/Friday..forecast till 8th April. Summary of events till Friday, 8th in Vagaries map; Click here for map enlargement. Now, with A1 moving away from tomorrow, Tuesday, I see precipitation decreasing in Kashmir and H.P. Rainfall will be restricted to the NE states and Orissa coast in the Indian region next 4 days, i.e. till Friday, 8th. April. Some covective thundershowers in Central India on Friday. 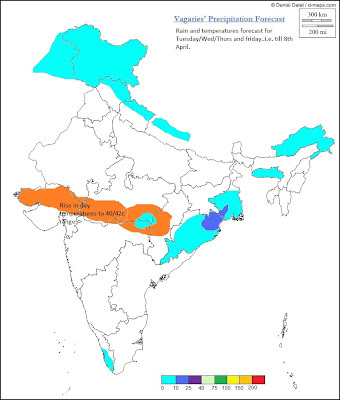 As the rain effect wears off, mild heat wave conditions, are expected to spread into the Vidharbha, Southern M.P. and Gujarat regions from Wednesday thru Friday. Ahmadabad could see a high of 42c by Thursday. Rise in Northern India may be to the high 30s, next 3 days. (Again, to compare the increase, see current days in the map above). But, as a line of wind dis-continuity may form, resultant convective rains and thundershowers will cool the days on Friday in Vidharbha and east M.P.regions. Nepal too, may see warmer days till Friday. However, some thundershowers in the hilly areas could be possible till Friday due to moisture remaining from A1. Mumbai: Pleasant for this time, with the days at 31/32c and nights a pleasant 20/23c. Quite comforrtable for Mumbai, with a week gone in April ! Interior maharashtra is, in fact shivering last few nights. As mentioned in vagaries. Pune and Ahmadnagar were 11c a couple of days ago. Even on Monday morning (4th), Nasik was 13.2c and Pune was 13.4c.Both 5c below normal. Several cities were around 15c. For Saturday,, 9th April onwards Vagaries will put up a fresh forecast, as A2 arrives and will be active. As of now, seems A2 is set to be a bit more active than A1.